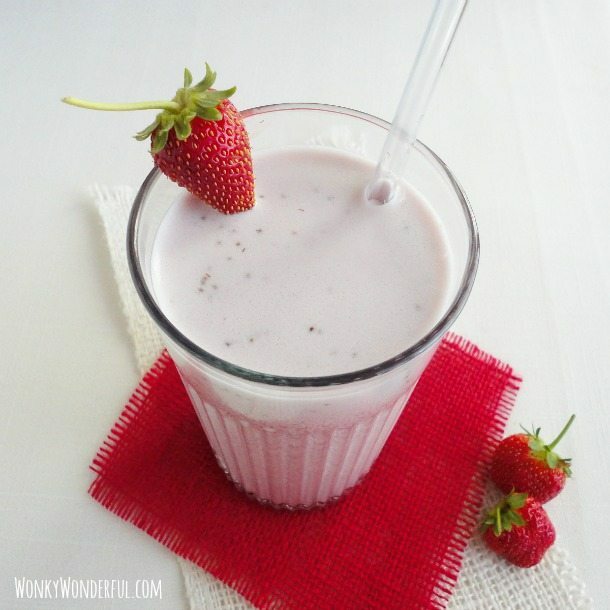 Homemade Strawberry Malted Milk made with fresh strawberries . . . This drink will make you feel like a kid again! When I was a kid I loved Strawberry Nesquik milk. So, when I decided to play around with a malted milk recipe I knew I wanted to go with a strawberry flavor. I was not disappointed, this Strawberry Malted Milk transported me right back to that seven year old little girl with the bad hair cut and a gap tooth smile. For me, it doesn’t get much better than those carefree mornings that I spent eating Honey Smacks and drinking Strawberry Nesquik while watching Saturday cartoons. That was considered a perfectly healthy breakfast back in the 80’s! Yes, I am officially an old fogey reminiscing about the good ol’ days. This is the grown up version of my favorite childhood drink. I use coconut milk, but the type of milk completely depends on your preference. 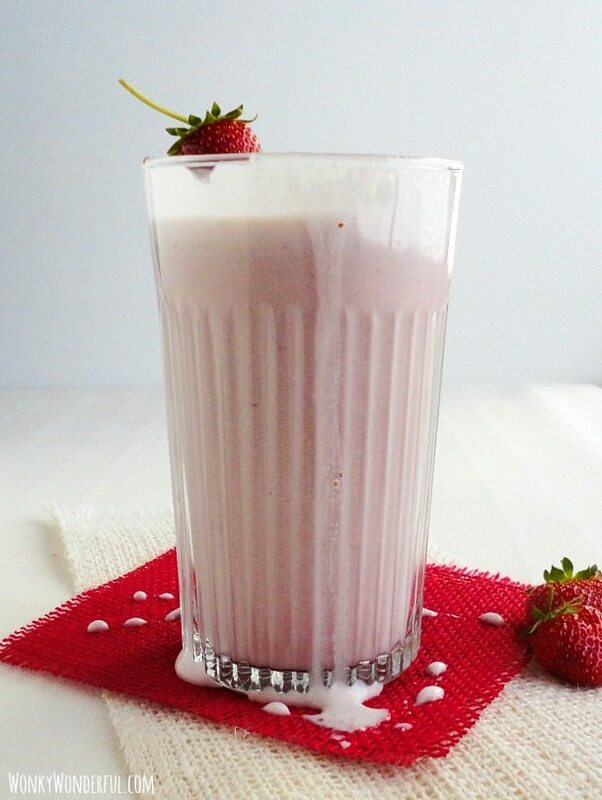 Add some malted milk powder, sugar and fresh strawberry puree for a delicious taste of the good ol’ days. This isn’t just for adults though, the kiddos will love it too! Puree all ingredients using a blender, processor or immersion blender. Pour liquid through a mesh strainer to remove most of the seeds. Transfer to glasses and Enjoy! *I used Carnation Malted Milk. You can find it in the aisle with the chocolate milk powders and syrups. **I use all coconut milk or half coconut milk and half dairy milk. Use whichever type of milk that you prefer. 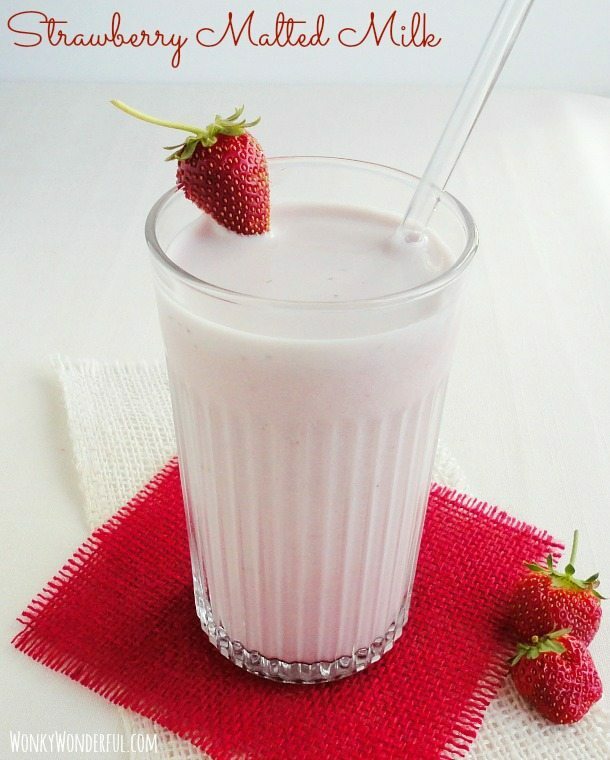 Love strawberry milk! I bet using coconut milk is perfect! Thanks Chris! You bring the burgers, I’ll bring the strawberry malts! Have a great week! 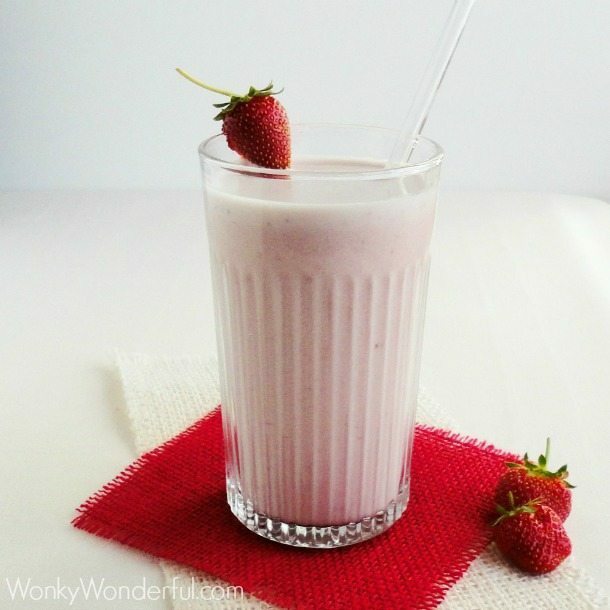 Yum, strawberry is the best flavor for desserts ever and I love strawberry malts. Looks delicious! Thanks Laura! I love the sweet summertime strawberries! I love this and it does bring back some memories for me too! Don’t forget Frosted Flakes! Hi Deb! Yes, and Cap’n Crunch! This milk looks so yummy! I haven’t had strawberry milk in forever. This looks delicious! Yummo, that sounds awesome, I was a quick fan myself especially on icecream! Hmmm, on ice cream … I may just have to try that one! Found your link through I heart Nap Time, and I am so glad I did! This looks so amazing! Hope to be making it soon! hi nicole this does bring back memories I will have to try this and not tell my boys its healthy. I’m visiting from the Sundae Scoop link party. Have a great weekend. I love me some good strawberry milk!! 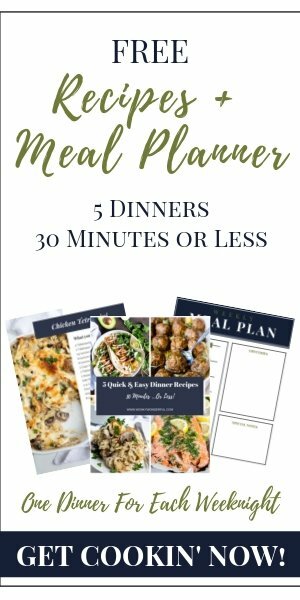 Thanks for sharing this yummy recipe, I will absolutely have to try it!